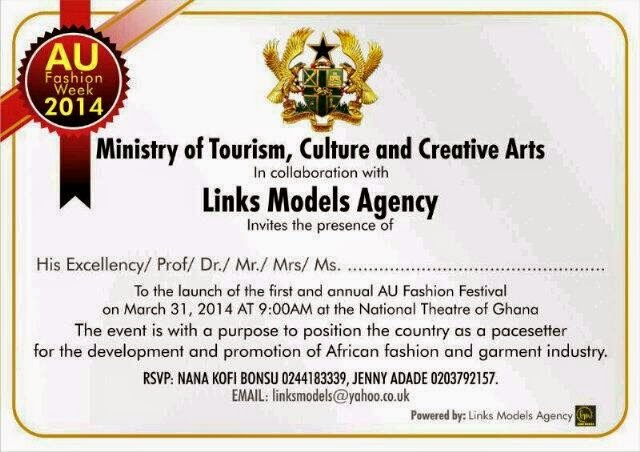 Ministry of Tourism, Culture and Creative Arts in collaboration with Links Models Agency are set to officially launch the first and annual AU Fashion Festival on 31st of March, 2014 at National Theatre in Accra. The event aims is to position the country as a pacesetter for the development and promotion of African fashion and garment industry. for further information contact Nana Kofi Bonsu on 0244183339.